Kalmyk Adventure Blog: The Motherland Calls! As the statue in Volgograd calls to the Russians, so does the United States call us back home. 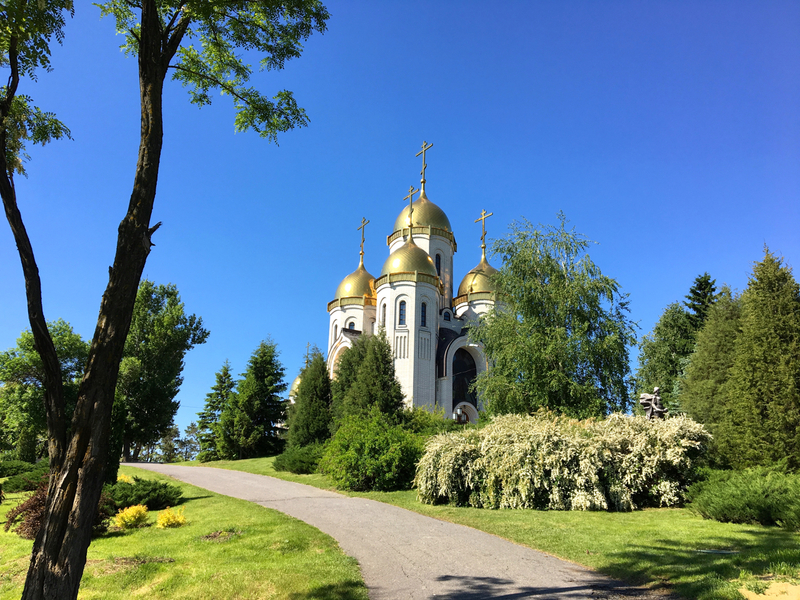 We have a few more blog posts about Russia to come, but we have in fact returned to our homeland. 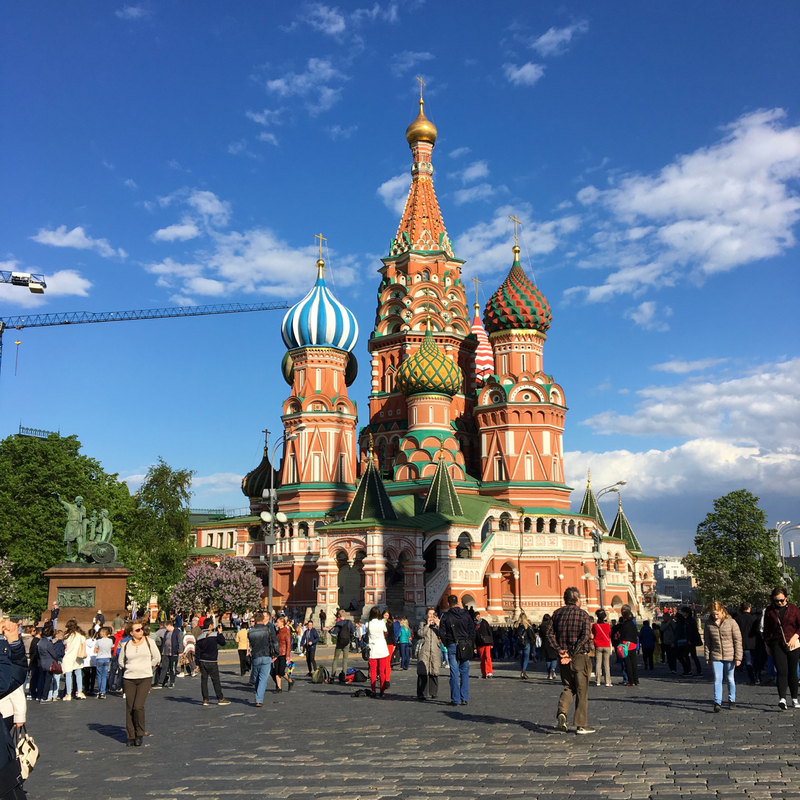 This post is about our last weekend of travel in Russia. Flying out from Elista can be a bit tricky. The airport is small--tiny, even--and is only serviced by one airline with three weekly flights. 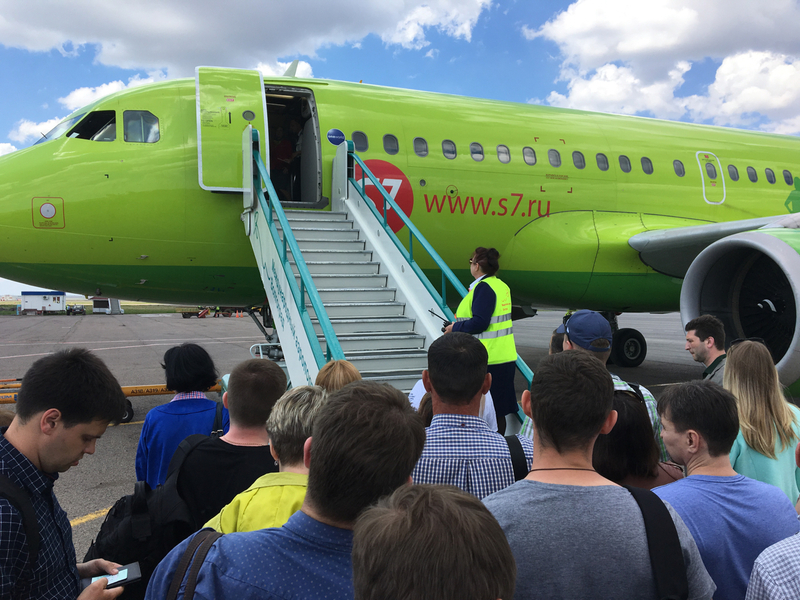 These flights are also very expensive in comparison to other air service within Russia. 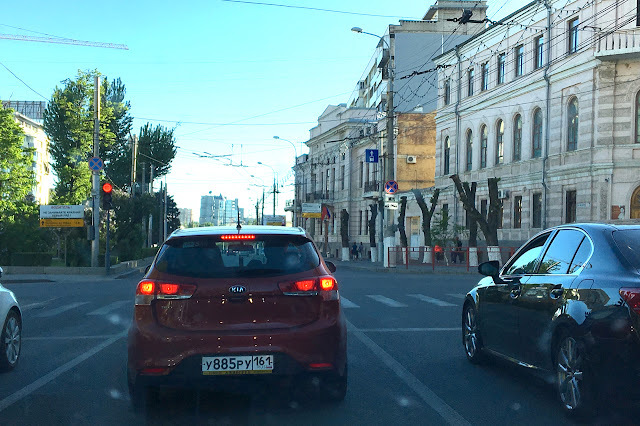 So a common alternative for travelers is to go to one of the nearby bigger cities (Astrakhan, Rostov-on-Don, or Volgograd) with more consistent air service to Moscow. For our flight to the capital, we chose to leave from Volgograd. 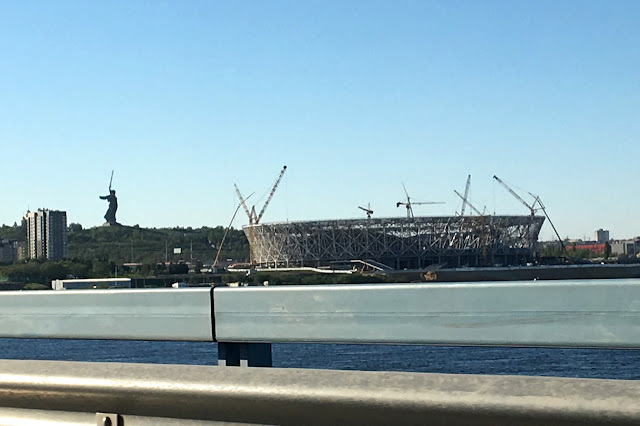 We were there earlier in May, and I had traveled through Volgograd during my previous visit to Kalmykia in 2010. So on Saturday we woke up at 4:00 a.m. to catch a taxi from Elista to the Volgograd airport. 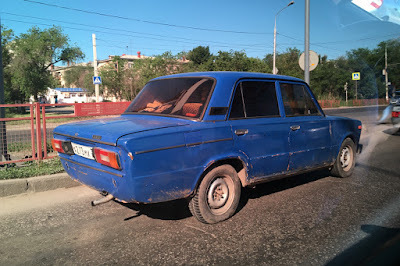 The service is incredibly inexpensive--about $15/per person for the 300km journey--and the drive gave us a chance to see the stretch between Elista and Volgograd in the early morning light (it was nighttime when we came back this way before). 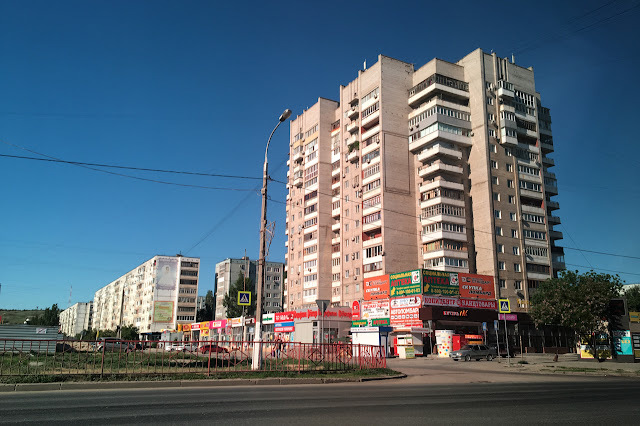 Entering Volgograd; Buildings here are generally larger and more densely built than in Elista. After a little more than three hours, we arrived in Volgograd. The city is known for its bad roads, and these have been made worse by construction that is underway to improve infrastructure for the 2018 FIFA World Cup. 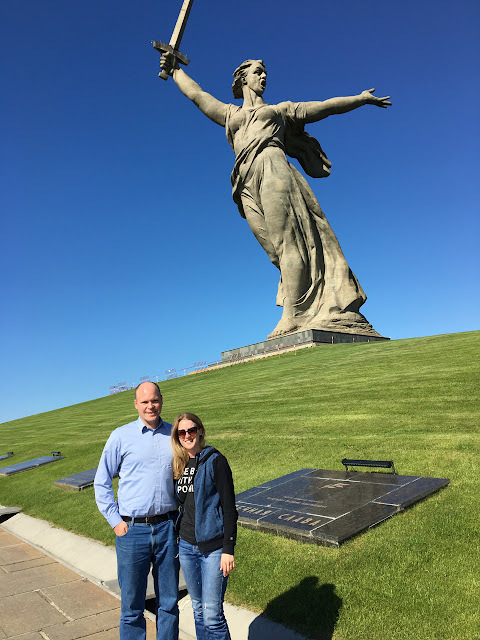 We had some extra time before our flight at noon, so we stopped for about 45 minutes at Mamaev Kurgan, where the memorial to the World War II Battle of Stalingrad is located. 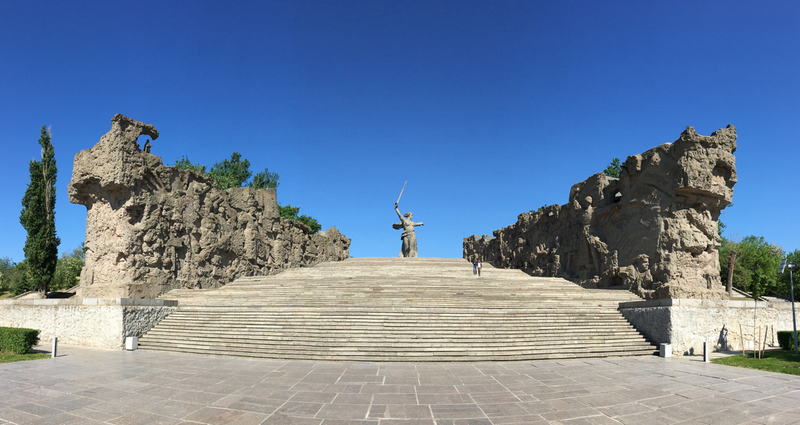 The kurgan--or hill--was the site of intense fighting between German and Soviet forces in the early days of the battle (September 1942). Eventually a sort of stalemate set in, with both sides controlling parts of the hill. The Soviets were able to hold out until they defeated the German forces in a counterattack in early 1943. 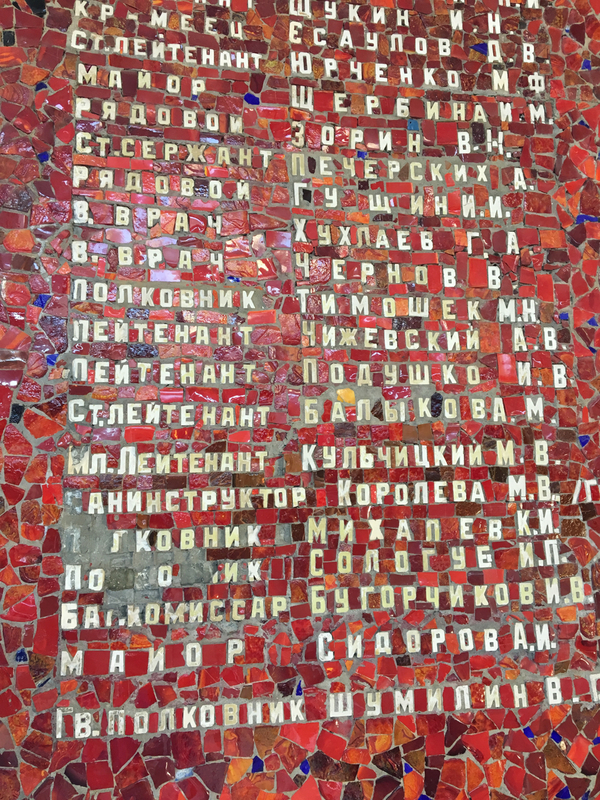 In commemoration of the battle, the Soviet Union began building a memorial on the kurgan in the late 1950s. 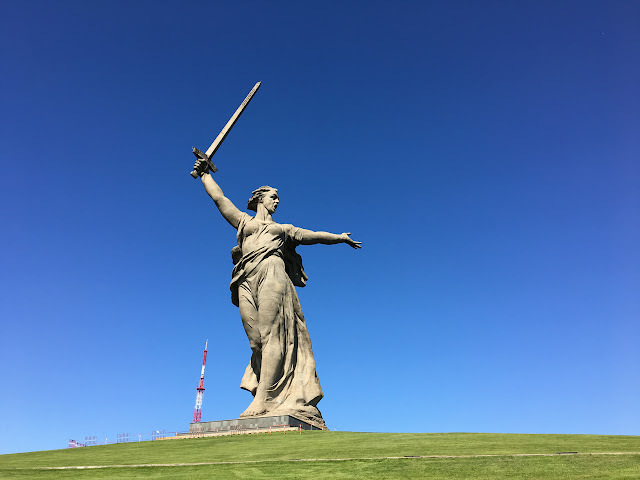 The Motherland Calls, which dominates the memorial complex and the skyline of the city of Volgograd, was finished in 1967. 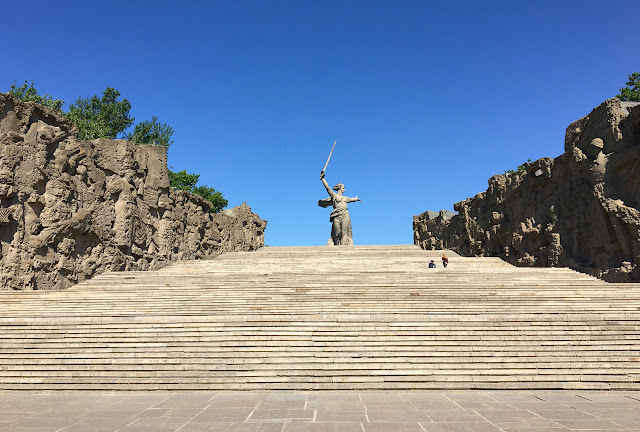 The Motherland Calls! is one of the world's largest freestanding statues. 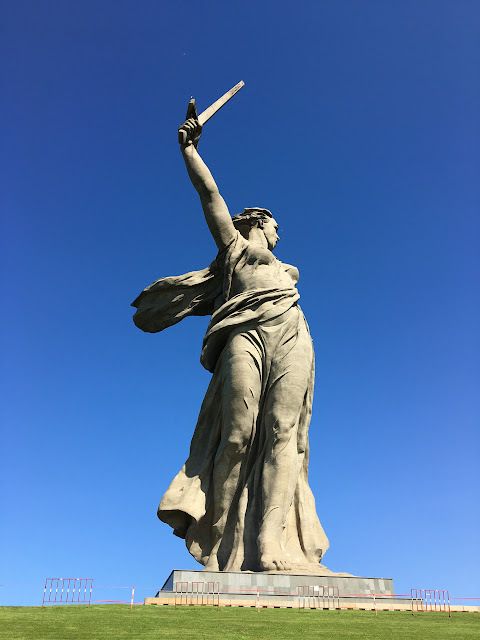 Her size is comparable to the Statue of Liberty in the United States, maybe a little bigger. 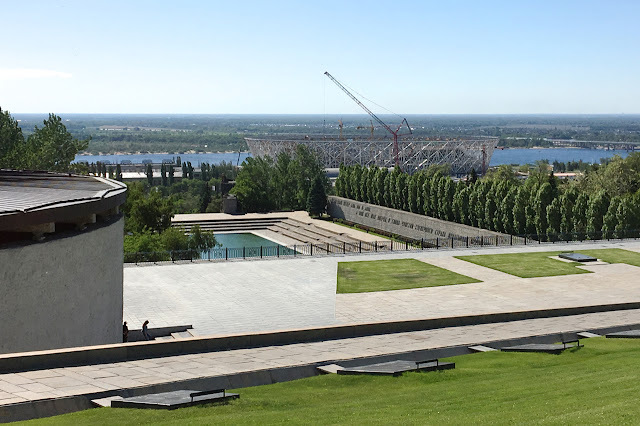 The traditional approach to the memorial is from the Volga River, on the east side of the hill. 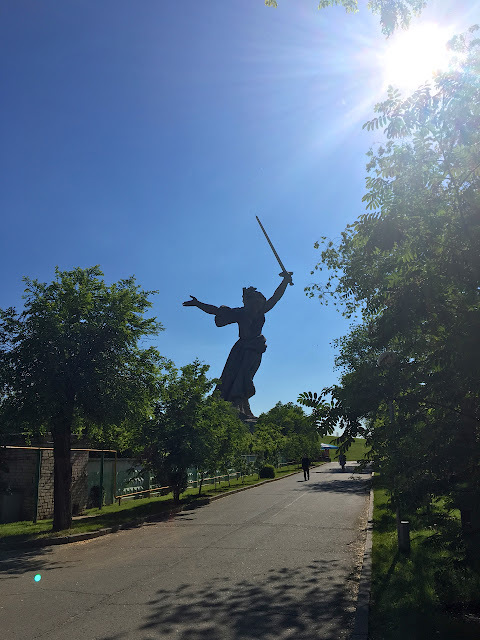 As you walk up, you pass an entry statue, an avenue of poplars (and fragrant choke cherry trees), and a pair of walls that symbolically depict the course of the battle. A view of The Motherland Calls! from below the walls that symbolically depict the course of the battle. 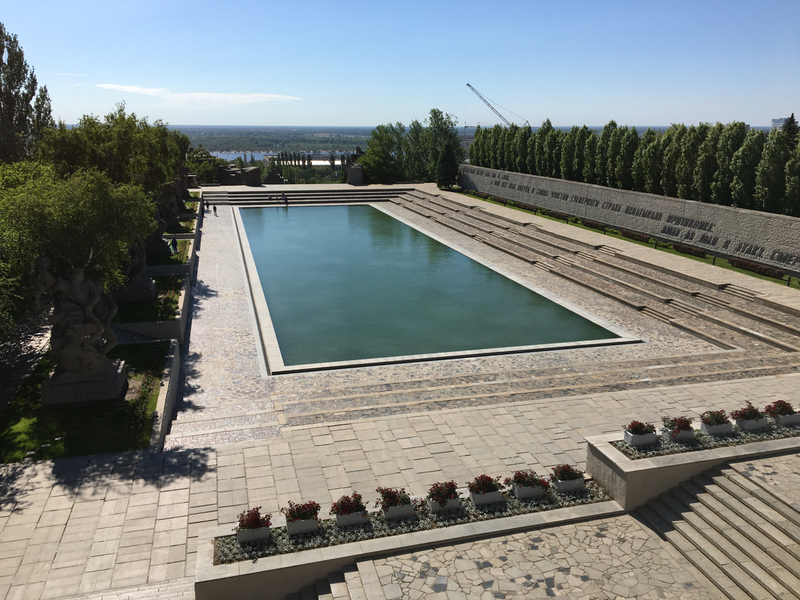 The people on the steps give you an idea of the scale of this memorial complex. We approached from the other side and didn't have time to make it all the way to the main entrance. We did get to see the symbolic walls, as well as the reflecting pond on the Square of Heroes, the military honor hall, and a number of smaller statues. The honor hall includes an eternal flame and the names of approximately 7,200 defenders of Stalingrad during the battle. It is guarded daily by Russian soldiers. Another view of the reflecting pool, with the stadium under construction in the background. 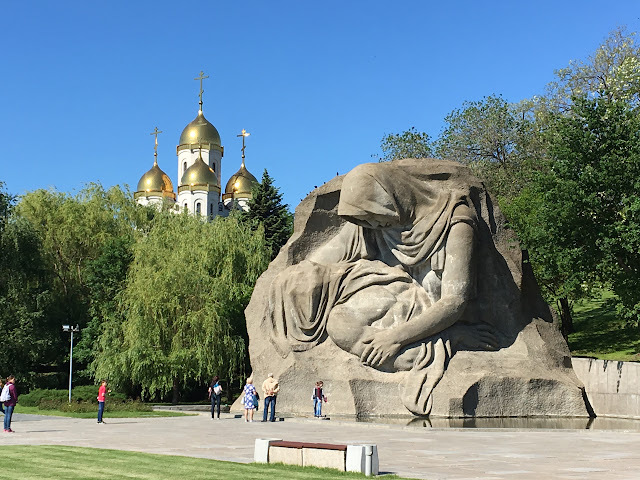 The "Mother's Sorrow" statue with All Saints' Orthodox Church in the background. After touring Mamaev Kurgan we went to the airport for our flight to Moscow. After checking in to our hotel, we took the train from the airport to the city center. 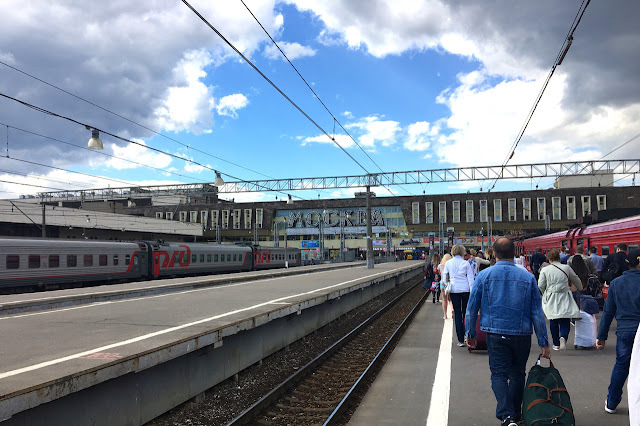 Moscow is served by three airports, and all three are linked conveniently to the city center via these trains. Our train was modern, clean, and very comfortable. 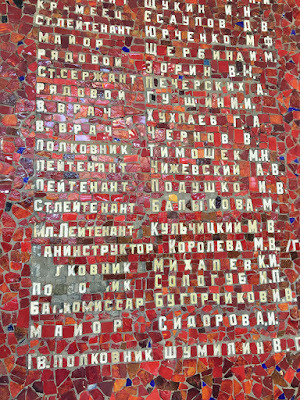 From the end station we hopped on the metro for two stops and went to check out Red Square. 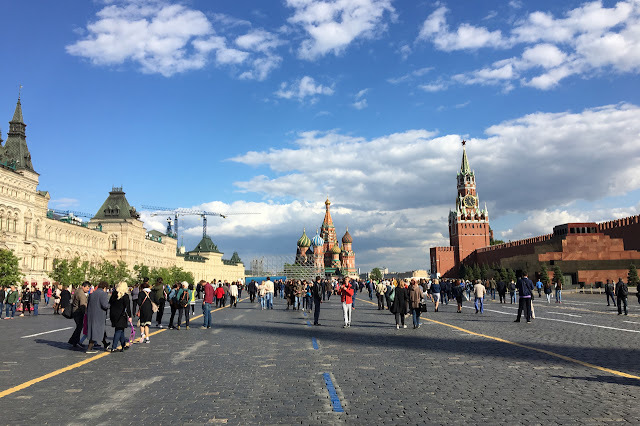 Red Square is the large open area to the northeast of the Kremlin. 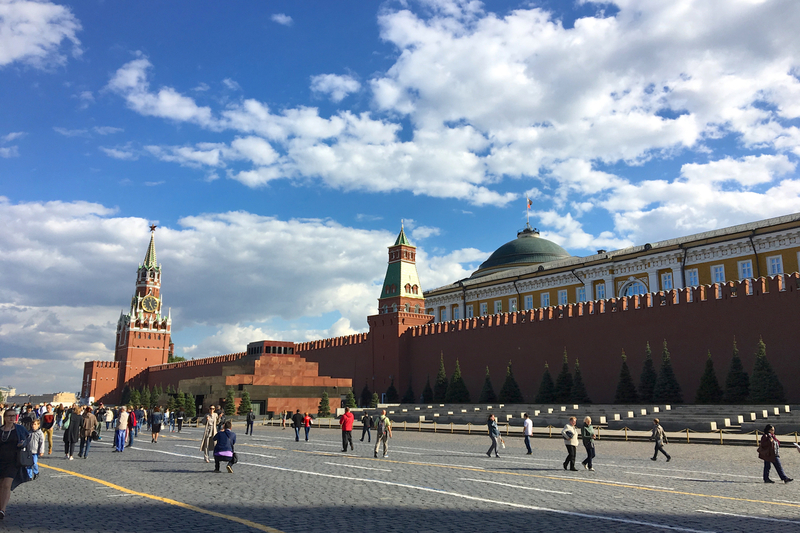 It's bordered by the Kremlin's walls, St. 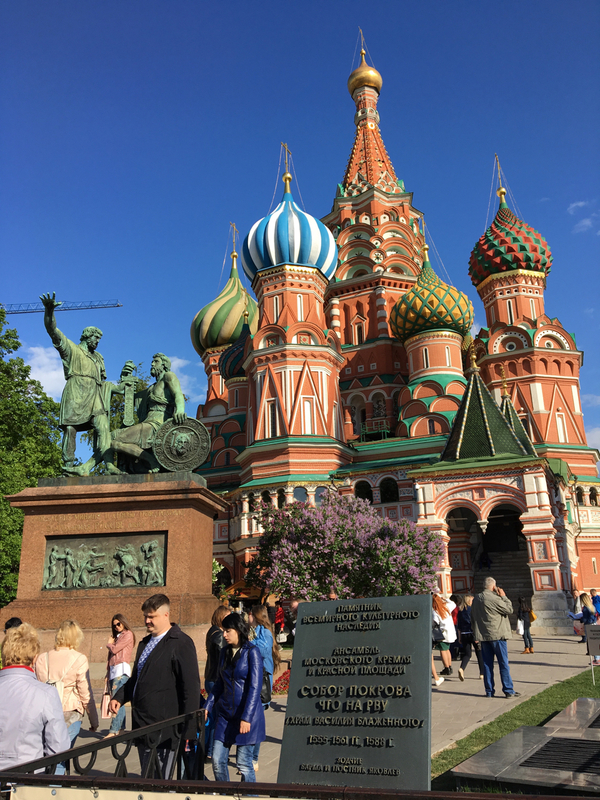 Basil's Cathedral, the department store GUM, and the state historical museum (counter-clockwise from the southwest). Lenin's mausoleum is also on the square along the Kremlin's walls, as are the burial sites of other communist party dignitaries and Soviet heroes (for example, Joseph Stalin and Yuri Gagarin). The interior of St. Basil's is unlike other cathedrals we have visited. Rather than one large room with vaulted ceilings, St. 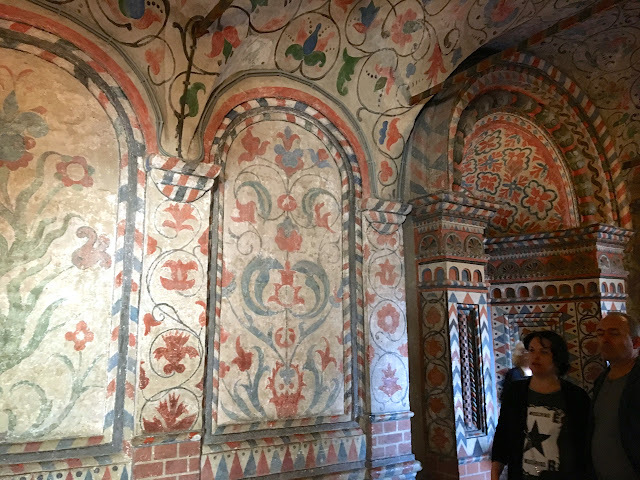 Basil's has a labyrinth of hallways and small niches across multiple levels accessible via steep, winding staircases. 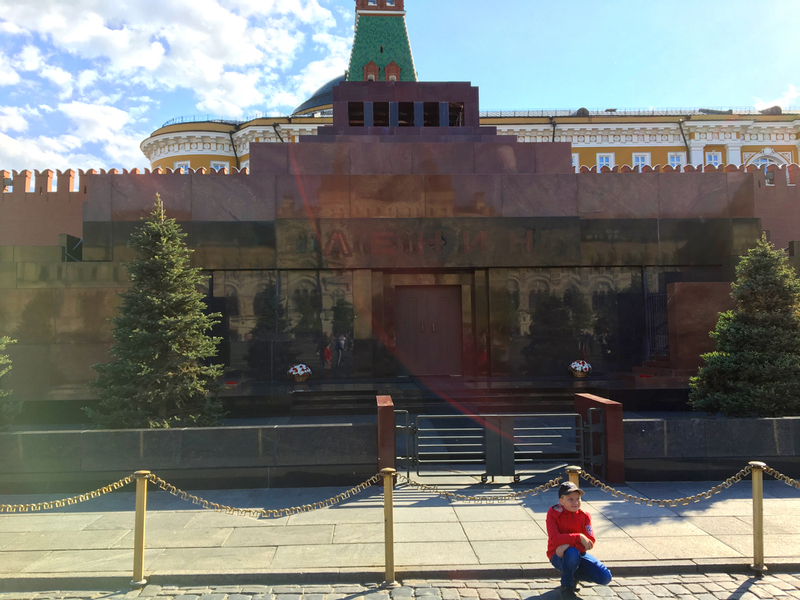 Lenin's mausoleum keeps strict hours, five days a week for three hours a day, and was closed when we arrived. Instead, we toured St. Basil's cathedral, with its byzantine interior, detailed chapels, and painted walls. 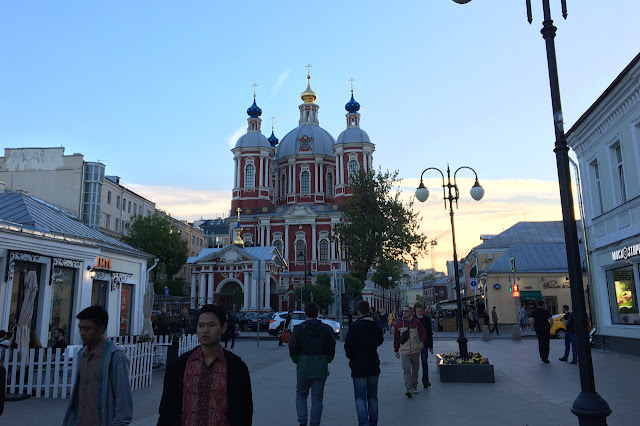 After our tour and another stroll through the square--where posing for Instagram photos was one of the main activities--we hopped back on the metro to meet a friend of mine from graduate school who lives in Moscow. The area around Novokuznetskaya metro station is bustling and increasingly hipster-fied; we found a good Irish pub (that didn't actually serve any Irish food) for our final meal in Russia. We then headed back to our hotel near the airport for a few hours of sleep before our early morning flight. I'm curious about the GUM department store...did you stick your heads inside? 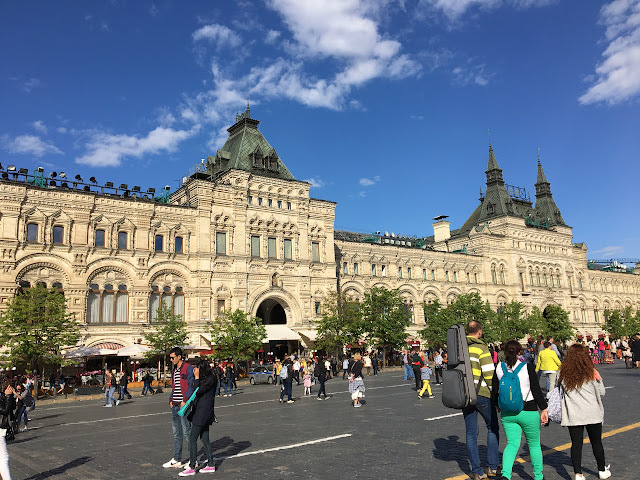 It is a shame that the Russian powers-that-be truncated the visit of such eloquent Americans, whose appreciation of the areas visited is evident in every post of this blog. Bureaucratic buffoonery is alive and well in both hemispheres.